Rice is one of my favorite foods. Add a good amount of fresh cracked black pepper and I can easily eat an entire pot of rice in one sitting. I don’t, but I can if I wanted to. Lucky for me brown rice gets the “OK” on the candida diet. However, I don’t want to eat it every day and find myself getting tired of it. Wait, would that even be possible? I don’t think I want to find out. Once again I went searching for recipes on Healthful Pursuit’s Candida Friendly Recipes page and saw Coconut Cauliflower Rice. I’ve had mock mashed potatoes using cauliflower before so why not try rice? It gave me an excuse to use both my food processor and spice grinder. The cardamom was very aromatic and added a sweet and spicy flavor with the creaminess of the coconut milk. The cauliflower cooked down to a soft, tender texture. I really enjoyed the flavor combination in this recipe. For those of you who aren’t fans of coconut, or stronger spices, there is a simpler version. Using the recipe above as a guideline, I swapped out the cardamom, coconut oil, and coconut milk for ghee and chicken broth. Added salt and pepper to taste and served it as a side dish with turkey stuffed peppers. I’ll be posting a recipe for those soon. 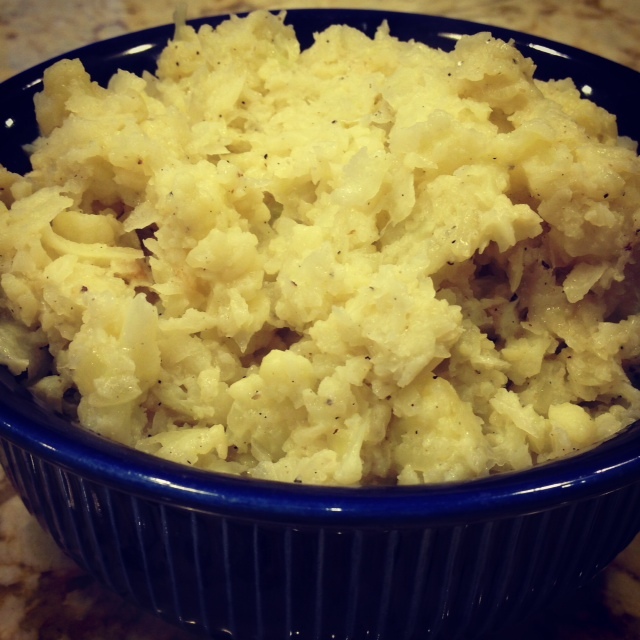 Do you have a creative cauliflower recipe? I’d love to know! Happy Thursday!